Webstresser.org, a popular DDoS-for-Hire website service on Wednesday was taken down by authorities from the US, UK, Netherlands, and various other countries in a major international investigation and arrests have been made. The website is blamed for more than four million cyber attacks globally in the past three years and had over 134,000 registered users at the time of the takedown. 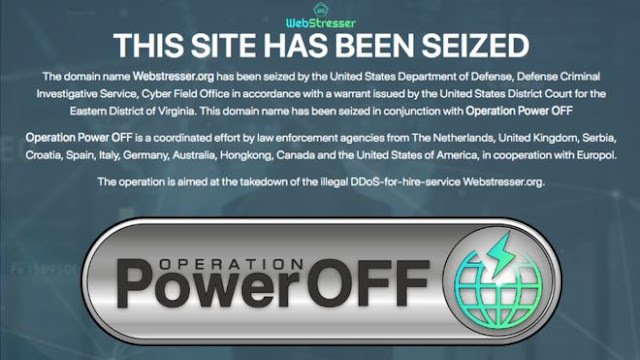 The operation, dubbed “Operation Power OFF,” targeted Webstresser.org, a website service which launched DDoS attacks all over the world at the buyer’s bidding. It involved law enforcement agencies from the Netherlands, United Kingdom, Serbia, Croatia, Spain, Italy, Germany, Australia, Hongkong, Canada, and United States of America, coordinating with Europol. The domain name was seized by the US Department of Defence. The website allowed criminals to buy attacks on businesses and was responsible for cyber attacks all over the world, including a British suspect who used the site to attack several high-street banks last year, causing hundreds of thousands of pounds of damage. “As part of the operational activity, an address was identified and searched in Bradford and a number of items seized. NCA officers believe an individual linked to the address used the webstresser service to target seven of the UK’s biggest banks in attacks in November 2017,” UK’s National Crime Agency said in a statement. The site was one of the various websites operating openly as a “stresser” service that offered to test a company’s cybersecurity defenses. According to investigators, the gang behind the website sold cyber attacks for as little as $14.99. Seven suspected administrators have been arrested over the last few days or subjected to searches by authorities. and computers have been seized in UK, Holland, and elsewhere. Law enforcement also took “further measures” against frequent users of the service, details of which have not yet been disclosed.